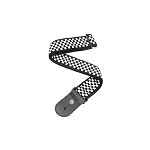 Planet Waves Check Mate guitar strap is the perfect accent for the rock, ska, and rockabilly guitarist making it a best seller. 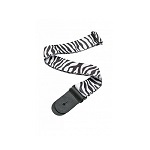 Rock out with some style with the Planet Waves Zebra guitar strap. Designed for players of all genres, Planet Waves Polypropylene straps offer designs that will please even the most discerning player. 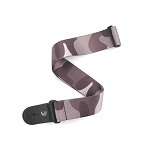 These durable straps are sure to accent any guitar, are a great value, and are adjustable from 39" to 69" long. 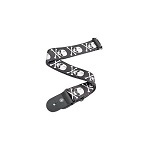 Add some attitude to your axe with the Planet Waves Cross Bone Skull woven guitar strap. 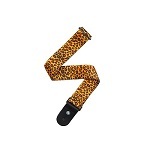 Rock out with some style with the Planet Waves Leopard guitar strap. The Planet Waves Flaming Dice patch adds a little character to this classic black design. 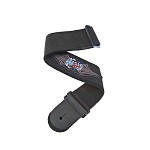 Planet Waves patch straps offer the perfect blend of fit and fashion. The 2" wide cotton webbing provides extra comfort and weight dispersion, while the patch graphics give a little extra attitude and toughness. From the patriotic eagle to the tribal skull, you can show your colors with this unique line designed by Lethal Threat. 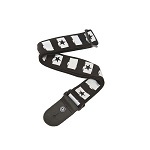 Show off your love of freedom with the Planet Waves "Live Free" patch strap. 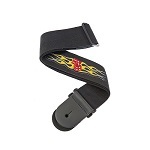 Planet Waves patch straps offer the perfect blend of fit and fashion. The 2.5" wide cotton webbing provides extra comfort and weight dispersion, while the patch graphics give a little extra attitude and toughness. From the patriotic eagle to the tribal skull, you can show your colors with this unique line designed by Lethal Threat. 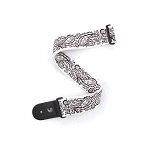 The strap has the classic look and durability to accent your guitar of choice. Designed for players of all genres, D'Addario Polyester straps offer designs that will please even the most discerning player. These durable straps are sure to accent any guitar, are a great value, and are adjustable from 39" to 69" long.